Your cat might be super vocal or one of the quietest kitties on the block. Regardless, all cats make noise at some point! If you think these sounds are random, you would be wrong. Cats use their sounds to communicate their thoughts and feelings about what is happening around them. After some close attention to these sounds, you might be able to pick up on what your cat might be trying to say. Did you know that, next to birds, cats have the biggest range of vocalizations of any other domestic pet? 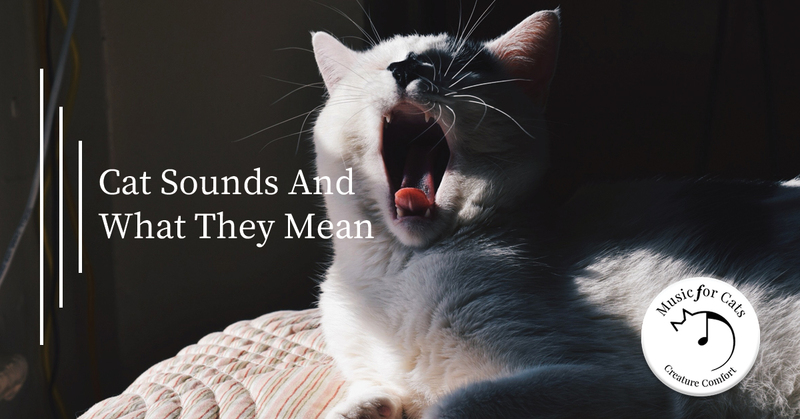 You might think these sounds stop at meows, purrs, and hisses, but that’s not entirely true. There are all sorts of variations of each kind of sound which indicate different things. Some mean that your cat is content, while others could mean they are about to attack. We at Music for Cats work hard to understand these nuances, and we have created music that emulates the sounds of cats. Read on to learn more about what these sounds mean. Did you know that meows are almost exclusively used so that cats can communicate with humans? They rarely, if ever, choose to meow to other cats in order to speak. Kittens begin meowing as a way to call for their mothers, but they usually stop as they mature. However, since domestic cats seem to think of themselves as our children for much longer, they keep their meows through their adult lives. Sometimes the meows indicate that they want food or access to a room, but other times it may simply be a greeting! Meows can indicate pain or loneliness, as well. Many aging cats will be more vocal due to their anxieties or failing senses. Younger cats use meows as more of a question when they are lonely or hungry. If they meow many times in a row, that means they are looking for attention! If your cat lets out a longer meow, it might mean that they are annoyed with you or object to something you are doing. While many people assume that this is a sound of contentment, that isn’t always the case. It’s true, gently petting a sleeping cat is a great way to coax out some soothing and content purrs. These sounds are normally a cat’s way of saying that everything is right in the world. However, on rare occasions, cats do use purring as a way to self-soothe when they are irritated about something. Think of this as similar to how humans sometimes hum or whistle when they are anxious. Looking at your cat’s body language will tell you whether or not the purrs are happy purrs. If their ears are back flat and their tail is flicking aggressively, that probably means they are anxious purrs. Cats learn these sounds as kittens, and they are quite a bit more declarative than a meow. While they begin as warning calls from mother cats to lead their kittens, adult cats might use this sound to get you to pay attention to them. They may also chirp at you to direct your attention towards something they deem to be important. Finally, your cat may make these sounds as a way of showing excitement or enthusiasm. If you have heard a cat chatter their teeth while staring intently at a bird right outside the window, you are not alone. This sound often comes with a squeak or faint cry, and it means your cat is excited. Many cat experts believe that this sound is a mixture of predatory excitement, but also frustration at not being able to attack the bird. Hisses are some of the most straightforward sounds that cats can make. It means that your cat is feeling threatened and is ready to fight if they have to. Usually, your cat’s body language will match: arched back, poofy tail, flat ears, and an open mouth with exposed fangs. If you see your cat hissing, do your best to remove the threat. The frequency of hissing will depend on what sorts of things threaten your cat. For some friendly cats, almost nothing scares them. However, a more shy cat will quickly start hissing if they are unsure about a new situation. If you have adopted a kitty that did not grow up in a safe and stable home, they may be more likely to hiss to scare off threats. Some cats will yell because they don’t like their environment, some will do it because their cognitive functions aren’t working as they should, and others will simply do it because they are bored. If you find your cat is starting to yowl more frequently, you should schedule a trip to the veterinarian. Check to see that your cat has enough to do during the day, though. Sometimes just an extra play session each day is enough to calm down your cat’s urge to yowl at you. This is a scary sound to hear from a cat. It may be when a cat is mating, or it can happen in the middle of a catfight. Usually, the screams happen right after a yowl and indicate that one cat has struck the other. Make sure you spay or neuter your cat, as unsterilized cats have a tendency to fight much more than others. Also, if you are worried about your cat getting into a fight with other cats, make sure to keep them inside. At Music for Cats, we have listened intently to each type of cat sound they make. From this, we have chosen the peaceful purring and other small interesting clips to piece together Music for Cats. Our full-length album is filled with species-specific music to entrance your kitty and help soothe them. If your cat suffers from anxiety, this might be just the relief they need. Give it a try today and order our album!